The program at Triangle Cross Ranch has proven to have the highest success rate in helping struggling teens overcome negative behavior. We customize a therapeutic program and an academic curriculum based on the particular needs of each student, which allows our staff to devote the necessary care and attention to your child. The Triangle Cross Ranch Catholic Residential Therapeutic Boarding School Program offers a “homeschool” course that functions in correspondence with accredited educational institutions such as Seton Hall and Our Lady of the Rosary, from which your child can earn a high school diploma. This alternative style of education is ideal for teenagers that have learning disabilities, a history of disruptive classroom behavior or are simply academic underachievers. A majority of at-risk teens are highly intelligent and use sophisticated means to manipulate the system, often inventing diverse distractions that enable them to conceal their prohibited activities. In an environment stripped bare of all distractions, most of our students channel their intellectual abilities toward their studies, motivated by a desire to complete our high school curriculum and return home. We find that over the 18-month period of our long-term residency program many of our students develop autodidactic abilities that will serve them well in their pursuit of higher education. One of the at-risk teens who attended our homeschool program had severe dyslexia and labored rigorously every time he sat down to read. Seemingly ironically, and to the amazement of both his parents and former teachers, this student graduated from our program and went on to receive a Bachelor of Arts degree in English Literature from the University of Montana, claiming that he “learned how to learn” at MTC Youth Ranch. Contrary to traditional scholastic systems that base the progression of education off of a 9-month academic calendar, the students in the homeschool program at Triangle Cross Ranch Catholic Residential Therapeutic Boarding School Program progress according to their retention of the material. This means that the advanced student will not be restrained by the abilities of his classmates, which often lead to boredom and disruptive behavior, and he will be able to begin new courses that will continue to stimulate his intellectual development. The struggling student, on the other hand, will receive extra assistance and instruction by our experienced staff who will work one-on-one with the student to help further his educational growth. 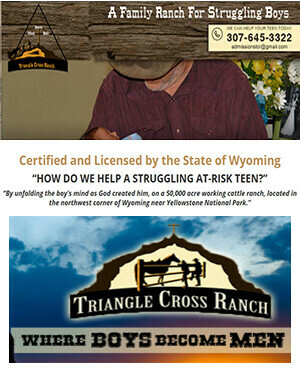 In addition to our homeschool curriculum, Triangle Cross Ranch also offers vocational/technical (vo-tech) training that will expose the at-risk teen to alternative professions such as welding and metallurgy, mechanical technology, carpentry, animal husbandry, equine training, and horticulture. The skills your child will develop in our vo-tech training programs can potentially lead them to lucrative careers that will give them a sense of both enjoyment and fulfillment. At Triangle Cross Ranch, a transformation occurs within the troubled teen, and with nothing to hide behind, his authentic self is revealed. With God’s help, we can discover and build on that foundation. The at-risk youth learns to take responsibility for their actions, to set achievable goals, and to make good decisions. Young men learn to stay organized even under adverse conditions, and they learn to appreciate what they have, changing their mental credo from “I need everything” to “I don’t need anything.” Furthermore, living closely with nature teaches detachment, survival instincts, to deal with fears, to trust in God, to use imagination, and to make use of problem-solving skills. Through the Troubled Teen Outdoor Adventure curriculum, students bond with and learn to work with horses, border collies, cattle, and other companions as they work. At-risk teens learn that they are not helpless in the face of adversity, but that they have control over their actions and reactions. If you want your son to appreciate and not take for granted what you have provided for him, then our Youth Ranch is a great place to help him grow in appreciation and thanksgiving for all that he has received. Young men who engage in our program leave with a deeper respect for authority, more self-discipline, and a new work ethic that will help them be successful in all aspects of their lives, including college and the workplace.